Sarawak is one of the two Malaysian states on the island of Borneo. It is also one of the founding members of the Malaysian federation alongside Crown Colony of North Borneo (Sabah), Singapore(expelled in 1965) and the Federation of Malaya (Peninsula Malaysia or West Malaysia). Like Sabah, this territory has an autonomous law especially in immigration, which differentiate it from the rest of the Malaysian Peninsula states. Today, the state is known as Bumi Kenyalang ("Land of the Hornbills"). Sarawak is situated on the northwest of Borneo, bordering the state of Sabah to the northeast, Indonesia to the south, and surrounding the independent state of Brunei. The administrative capital is Kuching, which has a population of 700,000.Major cities and towns include Miri (pop. 350,000), Sibu (pop. 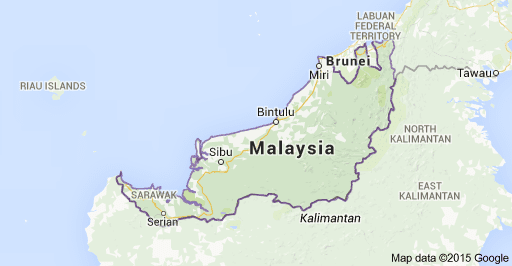 257,000) and Bintulu(pop. 200,000). As of the last census (2010), the state population was 2,420,009.